Turning small brown and grey bits of left over city into green space is the latest trend in urban landscaping around the world. Australia is following suit with a new project in inner city Sydney. Jennifer Stackhouse was at the launch of Sydney’s newest park project. Cities may be growing up and out, but there are lots of leftover pieces down at ground level, wastelands that look unsightly and create a management problem for local authorities. In recent years several such spaces have been given a makeover to provide much-needed green space for city workers and residents. London’s Mayor Boris Johnson recently announced two million pounds in funding for 100 ‘pocket’ parks in London from underused urban spaces into small green oases including a car park roof in Stratford which is set to become a fruit orchard. One of the success stories however is the High Line in New York. This goods line has been transformed into an elevated linear park that’s become a Mecca for tourists and New Yorkers alike. Once providing access to the Meatpacking District on the lower west side of Manhattan, the elevated West Side Line is now a 2.33km linear park complete with lots of seating among the trees, perennials and grasses. It is accessed by steps along its route and has encouraged rejuvenation of the area around it with lots of real estate development. The High Line has provided inspiration for a new park in Sydney along a disused rail line. Known as the Goods Line, it ran between what was the Darling Harbour Goods Yard and the main rail line between Central and Redfern stations. A length of the Goods Line from the Power House Museum to the redeveloped campus of the University of Technology is being transformed into a park to provide pedestrian access from Broadway to Darling Harbour. The park is being developed for the site’s owners the Sydney Harbour Foreshore Authority by ASPECT Studios. The site of the new park was the venue for the launch of the Nursery and Garden Industry Association initiative 202020 Vision in November, 2013. Sacha Coles from Aspect Studios is leading the design team for the Goods Line park. 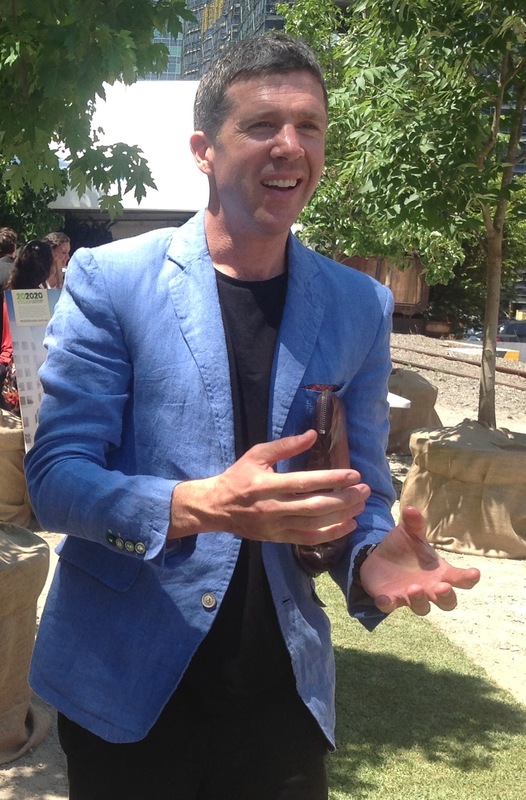 Speaking after the launch, the director of ASPECT Studios, Sacha Coles (pictured), said the area had been shut to people for 100 years or more and yet it is a vital link between Central railway and Darling Harbour (itself formerly a goods yard). It has been used as little more than a parking area and is sadly neglected. 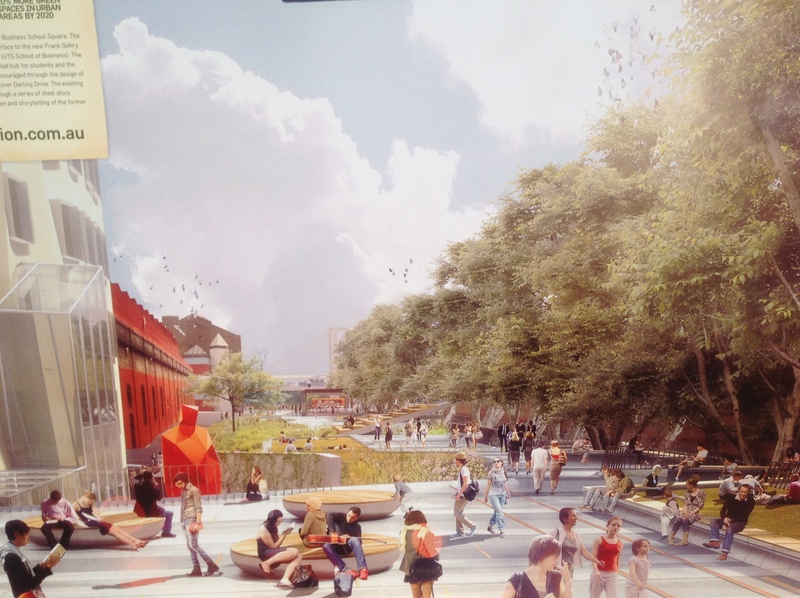 “We want the new park to be thriving and buzzy,” says Sacha. His aim is to create a place that’s about engagement, ideas and participation as well as a new pedestrian access and city oasis. The Goods Line has a four-metre elevation, well below the elevation of New York’s High Line, which at 7.6m above the pavement is accessed by steps. The Goods Line also has no issues with contamination. The lines will be left in situ, revealed where possible and surrounded by lawns, trees and sitting areas. Sacha says there are also plans for a meeting space. Tenders have gone out for the construction of the park, which should be completed in around 10 months and open in late 2014. “The 500m long park is around 20m wide. 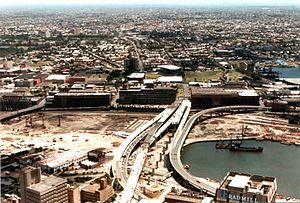 It is bordered on one side by Sydney’s light rail and on the other by a series of large buildings and smaller factory or storage areas. One of the key buildings for the park’s precinct is Frank Gehry’s innovative brick building (likened to a crumpled paper bag) for Faculty of Business for the University of Technology. The building, which is still under construction, is known as the Chau Chak Wing building. It is due to open in mid 2014 with space for up to 2000 students and 390 academics. Dr Chau Chak Wing donated $20 million to the building’s construction. At its northern end, beyond the Powerhouse Museum, it becomes a park for the people of Ultimo. At the southern or Broadway end it includes a heritage railway bridge, which is no longer structurally sound for the use of rolling stock. Sacha says the park will not remove any of the Goods Line infrastructure. It will lie dormant under the park and could be reused in the future. A key feature of the park is a round enclosed space designed for meetings. The simple structure is based on the Guggenheim Lab, which is a steel frame temporary building sponsored by BMW that moves from city to city. There will also be a children’s playground area. The area will be accessible at night with pole lighting providing high level of LED lighting around the new park.Recycled materials are being used where available. Planting includes some local and indigenous plants along with deciduous trees and lawns. As well as transforming a long-neglected industrial space into green and usable parkland for students, workers and local residents, Sacha Coles says it is part of a much a larger and long-term vision for the western side of the city. By using some existing tunnels and other space, Sacha says he would like to extend the walkway park extending from Carriage Works at Redfern in the south to Barrangaroo Parkland to north at the edge of Sydney Harbour to form a cultural ribbon for Sydney. For more of my stories see the current issue of Greenworld magazine or visit GardenDrum. This entry was posted in Greenworld Magazine, Nursery and Garden Industry, Parks and gardens and tagged 202020 Vision, Darling Harbour, Frank Gehry, High Line, Sacha Coles, Sydney, Sydney Harbour Foreshore Authority by Jennifer Stackhouse. Bookmark the permalink.